Part 1 Formation and analysis of hazardous compounds in heat-treated foods: The Maillard reaction and its role in the formation of acrylamide and other potentially hazardous compounds; Formation of acrylamide in cereal products and coffee; Formation of acrylamide in potato products; Mechanism for the formation of PhIP in foods; Latest developments in the analysis of heterocyclic amines in cooked foods; Analysis for acrylamide in foods; Molecular modelling approach to predict the toxicity of compounds generated during heat treatment of foods. Part 2 Health risks of acrylamide and other hazardous compounds in heat-treated foods: Bio-monitoring of acrylamide; Modelling of dietary exposure to acrylamide; Assessing exposure levels of acrylamide; Assessing human exposure to heterocyclic aromatic amines; Mechanisms of carcinogenicity of heterocyclic amines; Risk assessment techniques for acrylamide; The possible involvement of mutagenic and carcinogenic heterocyclic amines in human cancer; Health risks of 5-hydroxy-methyl-furfural (HMF) and related compounds; Factors affecting mutagenicity of heterocyclic amines. Part 3 Minimising the formation of hazardous compounds during heat treatment: Controlling cooking conditions and ingredients to reduce the formation of heterocyclic amines; Dietary compounds which protect against heterocyclic amines; Controlling acrylamide formation during baking; Novel techniques to prevent the formation of acrylamide in processed food. Although the aim of cooking foods is to make them more appetizing and microbiologically safe, it is now known that cooking and food processing at high temperatures generate various kinds of toxic substances, such as heterocyclic amines and acrylamide, via the Maillard reaction. Summarising the latest research in this field, this important collection discusses both the formation of health-hazardous compounds during heat treatment of foods and practical methods to minimise their formation. Part one analyses the formation of hazardous compounds in heat-treated foods such as meat, potatoes, cereal and coffee. Part two discusses the health risks posed by heat-induced toxicants. It includes chapters on bio-monitoring, exposure assessment and risk assessment, as well as chapters on the risks of specific compounds. The final part of the book is concerned with the key area of minimising the formation of harmful compounds in food products. This can be achieved by controlling processing conditions and modifying ingredients, among other methods. 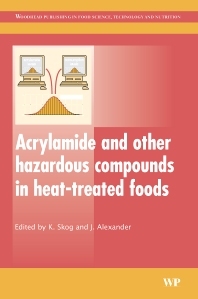 With its distinguished editors and international team of contributors with unrivalled academic and industry experience, Acrylamide and other hazardous compounds in heat-treated foods, is invaluable for all those concerned with this crucial safety issue throughout the food industry. Kerstin Skog is a Senior Lecturer in Applied Nutrition and Professor in Food Chemistry at Lund University, Sweden. Jan Alexander is the Director for the Department for Food Toxicology at the Norwegian Institute of Public Health and a Professor in Environmental Medicine and Food Toxicology at the Norwegian University of Science and Technology.